playing outside your safety zone." If you're cooking and not making mistakes, you're not playing outside your safety zone. Me learning to use an Instant Pot is like my students learning to use English. I bought an Instant Pot during the cyber sale over Thanksgiving weekend last year and as I went through the process of figuring out how to use it, I was reminded of the stages of language acquisition that English Language Learners go through as they develop fluency in English. * I was scared to try it because I didn’t want to do anything wrong and inadvertently break it — Just as newcomers are often scared to say anything in English for fear of saying something incorrectly. * So I held off for a couple weeks and let it sit in the box it came in, silently reminding me every time I looked at it that I needed to take it out of the box and make sure it functioned properly — Just like the Silent Period often experienced by ELLs. * Eventually I opened the box and found a place for my Instant Pot on my kitchen counter — After a while, ELLs gather up their courage and say a few words in English. * But I was busy and put off reading the instruction manual for several more days because when I first glanced at it, it seemed too technical — ELLs who are not proficient in English get easily frustrated when they try to read texts that are beyond their comprehension level. * When I did read the manual, it was very confusing and I didn’t understand it — The English language is confusing to ELLs when they first encounter it because they don’t yet have the social language, let alone the technical or domain-specific vocabulary needed to succeed in school. * I decided to take a risk and invited my parents and aunt over for a dinner in which the main dish would be made in my Instant Pot — At some point, ELLs decide they have to start using English, often because they want to socialize with their classmates. * I searched online for a recipe that looked easy to make — ELLs try out simple language first, using common words and phrases. * But I didn’t take into account the time needed to heat up the device, so we ended up eating much later than I'd planned – ELLs make lots of errors when speaking and still don’t understand grade-level texts at this point. * I wasn’t sure how to clean it afterwards and asked friends what to do — ELLs rely on their friends and other people to help them communicate in their new language. * I used it a few more times, cooking different types of dishes, but I still miscalculated how long it’d take to cook them — ELLs start using more complex features of the English language as they begin to feel more comfortable with it, though they still make some mistakes. * I took a risk and cooked dry garbanzo beans in it, because one of the main reasons I wanted an Instant Pot was to be able to cook beans quickly, and they turned out really well — As ELLs become more proficient, they experiment and try out new language structures. * I invited my aunt and parents over again to celebrate my aunt’s birthday and made a more complicated dish using the high pressure setting, and everyone thought it was delicious — ELLs are able to communicate well with others, making minimal errors and using higher level vocabulary and grammar structures. 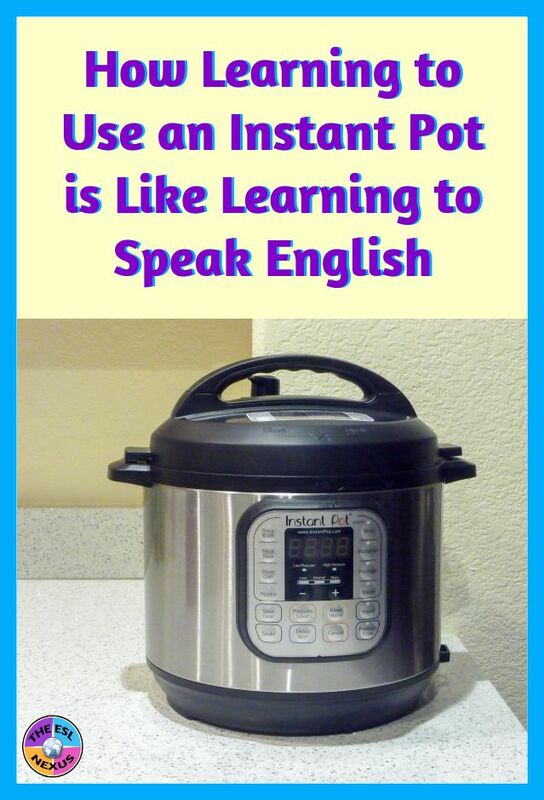 * I now feel reasonably confident in using my Instant Pot — As ELLs develop more proficiency and improve their skills, they, too, develop more confidence in using the English language for various purposes and it often becomes almost second nature to speak, listen, read, and write in English. Now, I am excited about using my Instant Pot and will branch out from just sautéing and following recipes to the letter to using the other functions and cooking more complicated dishes. I have become fluent in the language of the Instant Pot and understand how the recipes are written so now I can create original meals of my own. Likewise, ELLs in the last stage of language acquisition are able to use complex grammar structures and high level academic vocabulary when speaking and writing, they can comprehend the grade-level texts that they read, they are able to play with the language and make and understand jokes, they understand what they hear without first translating it into their native language, and they understand the songs and dialog they hear in movies, TV shows and podcasts. In other words, ELLs have become fluent in their use of the English language.